These flowers are a stunning, rich cobalt blue and with its slender leaves, it suits the name Blue Grass Lily (Agrostocrinum hirsutum). 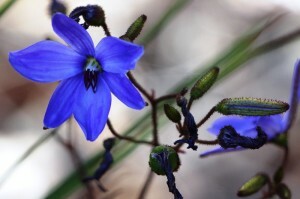 It endemic to southwest Western Australia and like many of the lilies are only lives for a couple of days. Its black anthers remind me of the character Davy Jones (Squidface) from the Pirates of the Caribbean!